"I had a very great time in Amsterdam. I sold one artwork and had very interesting connections." - Angelika Kahl. “Global Art Agency Looove the venue! gorgeous! – Lauren Jay Wondra, Artist. “Thank you for a memorable evening for sure” Sabira Manek, Winner VIP Guest Award. “Great weekend filming at De Oude Kerk with Global Art Agency’s Amsterdam Showcase.” – Oxford Media Factory, UK. "Thank you GAA organisers for the fabulous and extremely well-attended Art Fair at the amazing Casa Batllo. We enjoyed it very much with a great audience for our live body painting show. Thank you once again" - Maria Grazia Todaro from Queen Art Studio, Art Gallery. "I had a great time exhibiting at BCN Art Fair and have been very impressed with the organisation of this fair. Outstanding! I am happy to say that the piece 'Share A Coke With Maxwell' has been traded for (as I don't exchange my work for money), I have also been offered a sponsor from company that wishes to fund a residency in which I will create 3 more versions of the drawing that was on display. Thank you so much" - Maxwell Rushton. "I would like to thank the GAA team for the great exhibition! It was an honor to exhibit in this historic place, Casa Batllo, what an excellent team and perfect organization. Thank you" - Lina Levin. "It was a pleasure participating at Barcelona Showcase and it was a great opportunity. I hope that our paths will cross again soon, I will be following GAA's news and let you know if I am interested in participating in any of your future events or happenings. Thank you again for that chance." -Johnny Maroun, Artist. "Thank you all - GAA team, press, dear friends & supporters and of course ,my audience - for your support, trust, appreciation and respect, for all your wonderful comments, critics and compliments! To have all this treasure - is an enormous and precious gift for the artist!!" - Tatiana Loguinova. "The Barcelona Showcase 2012 was again the best opportunity to exhibit at one of the most famous places in Barcelona and Europe. Thank you very much to the whole team and sponsors for the great organisation. It was again a very crowded event giving the artists the opportunity to touch a much larger public I was expecting. The private party and prices ceremony were the best way to close a perfect day. I'm looking forward for next event which promises already a lot. Thank you very much." - Thierry Durand, Artist. "The best exhibition I did in all my artistic career "Barcelona Showcase" at a great place "Casa Batllo". In my opinion the most famous cultural building of Barcelona. All artists selected were very talented, every Artwork shown was very special, unique and so different. Unfortunately I could not attend myself, but trusted Barcelona Showcase Team and have been very professional! The General Manager helped me a lot with getting my paintings there on time, handled all my pieces with care, helped representing me together with my friend who was at Barcelona Showcase. They looked after it, as I would do it myself, with such care, professional and artistic minds. Without a doubt I will take part again to any art event organised by Global Art Agency and their member." - Mohamed Benhadj, Artist. "Thanks Natal. As always a great success like all art fairs organised by Natal Vallvé, really an honour to be part." - Javier Tomás, director Hotel Avenida Palace. "I really enjoyed The Oxford International Art Fair at the weekend, which enabled me to see where my own art might fit into the international art scene. I see now that my audience could well sell abroad, and I am excited to possibly show my paintings at the Barcelona Art Fair next time. It has been such a valuable experience, in meeting other artists and gauging their comments, as well as well as viewing public, and potential galleries. Thanks again" - Diana Archer. 'Delighted to have taken part in a second successful OIAF. My stand was in the beautiful main hall at the entrance, and we saw a steady stream of guests all weekend. The new, taller stands and brighter lighting were a good improvement. Had lots of interest, lovely visitors and good sales, thanks for a wonderful weekend OIAF and Oxford! Many thanks for all the hard work!" "I had a fantastic time at the Oxford International Art Fair. I was so impressed with how well the event was marketed and ran - a big thank you and congratulations to the whole team. I was thrilled to have sold 2 of my works to people who visited. I really enjoyed people's reactions to seeing my work, the smiles on their faces and the great comments I received (especially the kind gentleman who said he would buy the lot if only he wouldn't get in trouble with his wife for spending so much!) I was approached by an art dealer who mentioned that he would like to take some of my work to sell so hopefully something may come of that. Again many thanks for a wonderful event, I hope to see you again" - Alex Crump. "Thank you very much for bringing this wonderful news of all the press from Oxford International Art Fair. It was a very well organised event, and what a superb setting! I enjoyed taking part, and was lucky enough to sell 6 pictures :) Congratulations on the success and the feature by the BBC and the Cultureshow!" – Marina Jijina. "I sold 5 paintings in total last weekend and I did make a local gallery contact which was the whole reason for exhibiting so I was very pleased. Thanks" - Cathryn Jeff. "I had a Fab time on the Private View of Oxford International Art Fair on Friday night, indulged in a glass of wine too, it was so busy. I was very impressed, and such a success. My friend did purchase a drawing which was beautiful." – Mandy Woodford from OX / HC Magazine. "Thank you for a fantastic time The Oxford International Art Fair 2014! This event wil be remembered for a lifetime! Lovely atmosphere and organization! Only positive emotions, memories and new friends. Many thanks for all! "I was happy to see how my paintings with Bulgarian traditions glow in the Town Hall of Oxford! Thank you for the great organisation." - Vesko Stayn. "Another enjoyable art fair with an abundance of talent...our 2nd with GAA and certainly not our last... sold a painting last night via facebook because of the Oxford International Art Fair...lovejosimo...X"
"THANK YOUUUUUUUU it has been a great pleasure to be with u again. Had a lovely time! Your organisation the best. Till next Art fair." - Gianni Corda. "BIG thanks Global Art Agency Team for making dreams possible, Love Josimo." - John 'Josimo' Paaterson. Lots of compliments about my work. There are many photo's taken from my paintings. And also a lot of business cards where taken. "Thanks GAA! For the opportunity to show my work at the international Art Fair; in such a beautiful and great ambiance! "I have been so honoured to exhibit in such a lovely place at Rotterdam International Art Fair the with Global Art Agency. The organisation has been great and fantastic as always. And I sold some of my work!!! Thank you so much. You are the best in your job!!! Till next event, we will have a great time again!" - Ciao, Gianni Corda. "Thanks a lot for the organization. Very well done, with all the helping hands on it became a great success. The statue 'Between Art and Heaven' is sold." - Petra de Vree. "I want to thank you for the last show in Vienna, it was super, nice people, nice place." - Ronnie Jiang. "Many thanks for the Rotterdam International Art Fair, it was a great succes!" - Mariëlle Braanker. "I am so thrilled – after Vienna Showcase things are really on the UP! I was just invited to exhibit in New York (solo exhibition in Manhattan) March 2016- all expenses paid. Your excellent event in Vienna and the positive outcomes from it have been amazing." - Miro Tomarkin (also exhibiting at Oxford International Art Fair." "Thank you once again for the wonderful moments that you prepared for us in fabulous Vienna Showcase. It was a big pleasure to meet you again and other artists as well. We shared some interesting art and life conversations and always elegant and cosmopolitan Vienna left me big impression and many ideas for my future work. Looking forward to exhibit with you again." - Catherina Zavodnik. "Thank you for the opportunity to be a part at the Vienna showcase. Thanks for your support and for giving us the opportunity for extra promotion. I would also like to be part of Oxford International Art Fair. Hope to see you all again in a future event." - Milly Martionou. "Thanks for the excellent organisation by Joelle Dinnage, Natal Vallvé and the whole team of Global Art Agency! Thanks to all artists for the positive energy and much inspirations that we all got from each other. There were so many beautiful moments, constructive discussions, feedback, compliments and many new friendships. It was so wonderful that more than 150 artists from all over the world exhibited together in unity, peace, harmony and happiness in Vienna. We also have beautiful weather ordered specially for you." - Werner Szendi. "Dear GAA team, thanks for everything :) It was a pleasure to be in MOYA museum at Vienna Showcase." - Igor Zovko. "It was a great pleasure to work with you at Vienna Showcase. Exhibit organising was really great. It was magnificent! Thank you very much." -Alexey Yarygin. "Thank you for your hard work. I got a lot of positive reaction on my artwork and I made some good contacts. Thank you. Sjaricia Mercera. "Thank you Global Art Agency and all the artist for best two days in my life!" - Mariusz Kędzierski. "I enjoyed the exhibition and the people were very friendly, thank you." - Khrissie McCammon. "I'm so happy that I was there!" - Stefan Petrunov about Vienna Showcase. "Thank you to Global Art Agency for giving me a platform to sell "Snow Monkey, 2016 SABET" for ¥1,300,000 Tokyo International Art Fair - it was an amazing moment and I'll forever be grateful to you and your team! Can't wait till next year!" - Sabet (California). "My dear Joelle I want to express my deepest gratitude for you, Natal and the GAA team for the organisation, am sure that you will hit high in the near future due to your dedication and follow up. "I wanted to personally thank you for the wonderful experience in Tokyo. It was an honor to be apart of your organization and Suzy and I truly had the best time. We will be applying for Barcelona! Let's stay in touch through out the next couple of months. Thanks again for everything." - Hanna, Assistant Suzy Kellems Art Gallery. 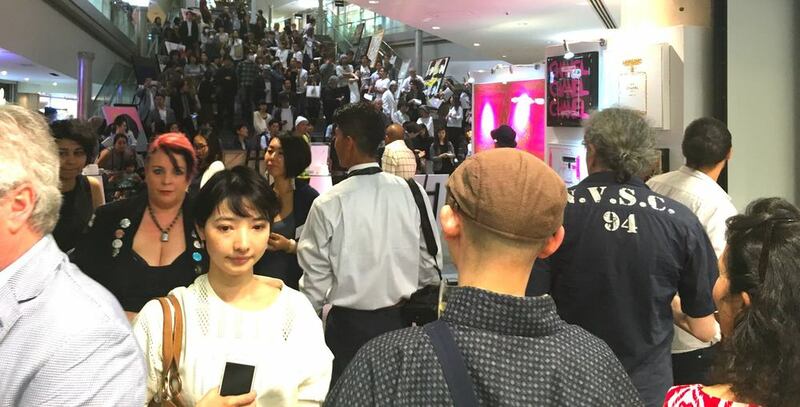 "I travelled from Okinawa to Tokyo to participate in the International Art Fair. It was very well organised in a great venue and my stand came together effortlessly. I got to meet many new artists and ARTfans, getting a great feel for my work and professional direction. Selling a painting was a highlight for me and a real confidence boost. I've also received after-sale queries from galleries and potential clients. Joelle, Natal and the whole GAA Team worked tirelessly to help us all with anything we needed and was always met with a smile! I will certainly be joining up with the GAA Team and Art Fairs again in the future. Many thanks for a great experience." - Dawn, aka : Sunrise Welward Art.